In today’s age of push-down curriculum and high stakes testing, teaching children to read on their own is on the minds of parents and teachers of young children. While I strongly advocate the teaching of reading and phonics, I caution against starting too soon and expecting 4-6 year olds to read independently. While some young children are self-motivated and ready to read, not all of them are. Children these ages still need to play with oral language and learn more about the structure of the English language in engaging, playful ways. They do this naturally by listening to high quality stories being read aloud by beloved family members and teachers. We cannot allow the read aloud to disappear from our classrooms and homes. As adults, we have a great deal of power to influence a child’s perception of reading by how much value we place on our time reading together. A read aloud should be done in a safe and comfortable environment. When possible, put a child on your lap as you read and engage in conversation together. As you read, you should convey your enjoyment of the story and give opportunities for children to engage with the story with you. In preschool settings, puppets and other props can help tell stories in very engaging ways. Give children a chance to hear a story multiple times and then interact with the story through dramatic play, songs, and other related stories. In early childhood, we are also exposing our children to the emotional connections we can make with a good book. Read alouds should begin at birth. Infants learn by listening to your voice inflection as you read and by connecting with the emotion in your voice. At just a couple of months of age, babies can touch the pages of a book and begin to make a tactile connection. Board books and cloth books are perfect for young babies. As they approach toddlerhood, babies can turn the pages as you read and begin to repeat words or sounds they hear as you read to them. There is a give and take in this reading relationship…the adult reads and the child responds. The adult encourages this interaction and the child shows satisfaction and enjoyment through coos and laughs. Toddlers will often request a book again and again because they recognize the positive emotions they experience through this read aloud time. They have also made connections with particular books that they love. Most of all, they are making a connection with YOU, the trusted adult who is guiding them through this language discovery. As children age, the books they request may change, but what they gain from the read aloud relationship stays the same. Even teenagers benefit from a good read aloud. For my son, Goodnight, Gorilla, by Peggy Rathmann was the first book to which he made a strong emotional connection. It had to be the last book read every night for almost 2 years, starting when he was a toddler. It provided a sense of security for my son, as we sat together reading this familiar book that he associated with togetherness and happiness. Now our copy of Goodnight, Gorilla is in a keepsake box. The cover is close to falling off and the edges of the thick, cardboard pages are worn with love and use. It is an example to me of how we emotionally attach to books. This is a connection we want to continue into adulthood. I can remember the feeling a had reading A Wrinkle in Time by Madeleine L’Engle for the very first time. I couldn’t get enough. I was completely drawn into that world and was desperate for more. I had the same emotional response to The Hunger Games series by Suzanne Collins(which I read as an adult). I was lost in the storyline, motivated by the emotions conjured up in the reading. 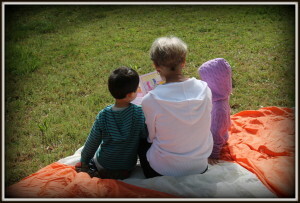 The question I ask myself is, “do we have the same emotional connections to books if we did not experience high quality read alouds in childhood?” I don’t know the answer, but I believe that we raise stronger and more engaged readers when we model these emotional connections through reading aloud all throughout childhood. So, what are your favorite books to read aloud with your children, grandchildren, or students? How can you advocate for Read Aloud Day EVERYDAY? Sylvester and the Magic Pebble was a go to for my sister and I. We loved it!!!! That was definitely one of my favorites as well!